My Bangkok airport arrival was on schedule and the Thai Airways plane landed just after 6:00am without incident. Fortunately on this occasion the air bridge was right opposite the Immigration counters and so it was just a short walk over to the immigration counters. As luck would have it there was no big queue of people waiting to have their passports checked and consequently I passed through Immigration Control very quickly. Once in the baggage hall I checked the baggage carousel board to confirm where my bag was going to be delivered and went to collect my bag from the luggage carousel. The bags had not started to arrive yet and I reached for my mobile phone to make a call, only to find that my phone had gone from my belt. I had checked the mobile phone was there before leaving my seat on the plane, just after the flight attendant had said, "and remember to take all your personal belongings and travel documents with you", but it wasn't there now. I couldn't believe this had happened again. Not two weeks before, my mobile phone had dislodged from my belt, as I got out of my car in the car park at work. Fortunately on that occasion I had found it by retracing my steps. As panic began to set in, I realised that there was a Thai Airways official standing nearby. I told her about my loss and she directed me to the Thai Airways baggage office that was about 15 metres away. By this time the carousel had started whirring and bags were beginning to appear, so I waited a couple more minutes and collected my suitcase from the baggage carousel. I was still racking my brain about how I could have lost my mobile phone, as I am usually so careful. My Bangkok airport arrival did not get off to a good start. Ever lost your baggage at Bangkok Airport or left your valuables on the plane? 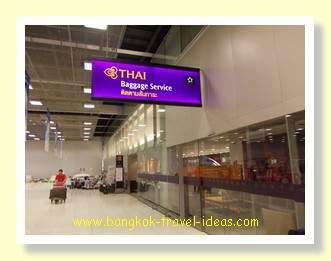 Continue reading to find out what happened when I visited the Bangkok lost baggage office. Then continue to read about my visit to Pattaya, Thailand by following the links below to learn what to do and what not to do. How to get the best price for a taxi from Bangkok Airport to Pattaya. Learn some bargaining skills when getting a taxi ti Pattaya. Need a great Pattaya Hotel? Read my review of this 5 star hotel in Wongamat Beach, North Pattaya. Swim in the pool, scare yourself silly on the waterslides or just float on a raft along the moving watercourse. It is family friendly and is a great place to stay. See my not so exciting look at Pattaya nightlife if you are thinking of coming here with the family. 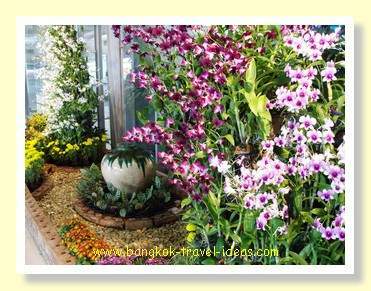 Things to do and places to see around Pattaya. Visit the Floating Market in Pattaya on Sukhumvit Road just outside Pattaya and have a real Thai day out. My experience of visiting the Sanctuary of Truth is incomplete, but here you can find directions to this wonder of the world and a brief overview of a special Thailand folly, for the next time you visit Pattaya. To the North of Pattaya is Wong Amat beach and here you can go dine on Thai food at Rim Talay restaurant, overlooking the ocean. Lunch time or evening time under the stars; take your pick. My Bangkok vacation has come to an end and it is now time to travel back from Pattaya to Bangkok Airport and take the return flight home. How to get from Pattaya to Suvarnabhumi Airport.